Steamboat based photographer Noah Wetzel turns to the wilderness for inspiration. A lot of people pull their share of the weight at work, but Noah Wetzel carries it all on his back. The 29-year-old photographer regularly hauls heavy gear into the wilderness, sometimes hitting the trail in the middle of the night to get to a prime location by first light. Sometimes he does this for days on end, and the hours and the intensity of his labor can be grueling. “But once I’m out there, it’s always worth it,” he says. 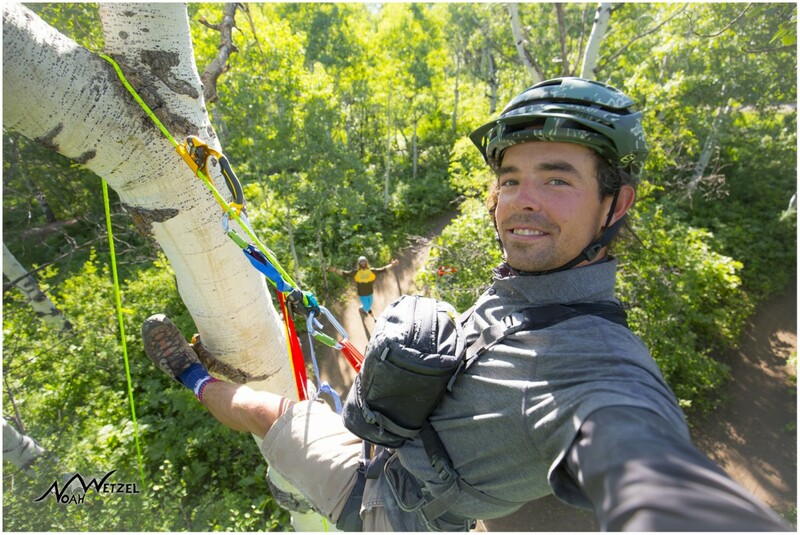 The Wisconsin native moved to Steamboat sight unseen to attend CMC in 2005 and, inspired by the freeskiing movement and the ski and snowboard videos of the early 2000’s, knew he wanted to document all the fun that could be had in the mountains. Eventually, he traded in the video camera for a professional grade still camera and found his calling as a photographer. Focused mainly on landscape and action photography, Wetzel splits his time between Steamboat and Alta, Utah, aiming his lens at wherever the trail—and the adventure, however unexpected—might lead. SSIR: How did you get into photography? Noah Wetzel: I started skiing when I was 14 and freeskiing had just started to gain momentum. Watching my idols travel the world, skiing and documenting the fun with their friends inspired me. I decided to move to Steamboat and go to CMC with my friend Graham even though I’d never seen a picture of the town – I knew both college and skiing out west were a necessity. Throughout college I continued to film, however when I graduated from CMC in 2007 I sold my film equipment and picked up my first DSLR, a professional grade still camera. I had an eye for composition but that’s about it. I was totally self-taught. So I just started shooting and learning, and it all evolved from there. SSIR: How would you describe your style? NW: I love shooting action and working with talented athletes, but I really love shooting landscape. It gets me out into the wilderness. I’m alone a lot of the time and it’s very meditative and peaceful. Showcasing the landscape and focusing on composition and light applies to all the photography I do. I try to capture the natural beauty of the location in each shot regardless if I’m shooting landscape, action, lifestyle, or portraits. NW: Just being in the wilderness and feeling the power of nature combined with a passion for travel and meeting unique individuals. Every time I find my creativity lacking or I feel exhausted and start to question things, I venture into the wilderness and immediately the creativity and inspiration start flowing once again. With every wilderness experience or road trip I always return recharged and motivated to keep moving forward towards my goals. SSIR: Are you more technically oriented or creative and how do you balance the two? NW: I’m more creative for sure. I’m completely self-taught. I’ve never been a gear head or one for specifics. I’ve had to figure it out through experience, adjusting on the fly until repetition makes specific camera settings an obvious choice. Every day you learn something new as a photographer, no matter what level you’re at. I also like shooting stuff that’s out of my comfort zone because that’s how I learn. I think the best photographers are the ones who can shoot anything. If I have a camera in my hand I’m happy no matter what. SSIR: What is your favorite season/time of year to shoot? NW: I love the fall colors in Steamboat, and it’s off-season, so I have more time to get out there and shoot what I want. SSIR: How far will you go to get the shot? NW: As far as I need to go. I’ve done some pretty crazy stuff. As a photographer you need to have a lot of energy…to be able to dig deep when needed. I often haul a ton of gear and sometimes I have to function on very little sleep, but as soon as I get out there it’s worth it 100 percent. Sometimes you can grind it out hiking 8 miles in the dark, but mother nature is the one who decides if she’s going to put on a show or not. You have to have a lot of patience. SSIR: Tell us about your involvement with Steamboat Sotheby’s International Realty. NW: You would think that with a real estate company, they’d just want photographers to shoot houses for listings. But that’s not the case at all. They want photos that represent this community and the beauty in the surrounding area. They want to showcase Steamboat in the best possible light, and so do I. To learn more about Noah Wetzel and his work, CLICK HERE to check out his website. CLICK HERE to view Noah’s photography featured on the Destinations page of Sotheby’s International Realty.